With the ever increasing daily pressures and work commitments, it is becoming harder to make the time to be without your vehicle for the service to be completed. 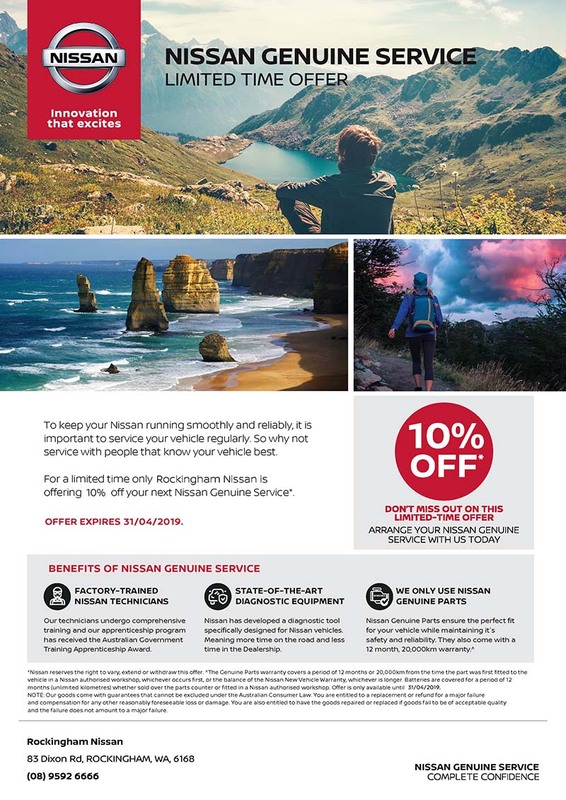 Rockingham Nissan understands this and therefore can offer you the solution with Nissan’s latest advancement in customer service with “EXPRESS SERVICING”. Our highly experienced Service team will make your service experience a positive one. Our workshop utilises the most up to date equipment and with our years of experience, allows us to give your Nissan passenger car or 4x4 the best service possible. Additionally, we offer a courtesy local drop off & pick up service. (Please check times with your service advisor), plus a limited number of courtesy vehicles are available on a booking basis. (for a small fee to cover insurance). Should you require a vehicle or courtesy shuttle, please inform your Service Advisor at the time of booking to ensure the service will be available when you require. For further information please contact our friendly Nissan Service Team for assistance. You are also welcome to wait in our customer lounge area which includes complimentary tea and coffee facilities and TV.